I created this blog to share with my friends and families about what I love about life. Most of the entries may focus on the Little guy but will occasionally add my Other Love (Hubby, family; Love of creating; Drawing; Mixed Media art; Photography, Beading and Wire Art). 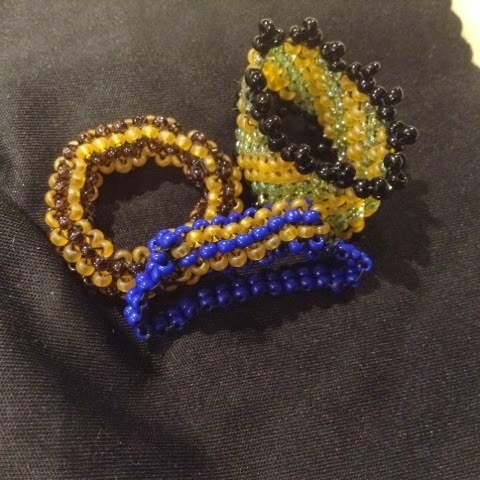 In one of my previous entry, I indicated that I received a candy of goodies from Carmi (courtesy of John Bead Corp, consisting of a variety of Dazzle-it beads, beading needle, and rings by Giovanna. 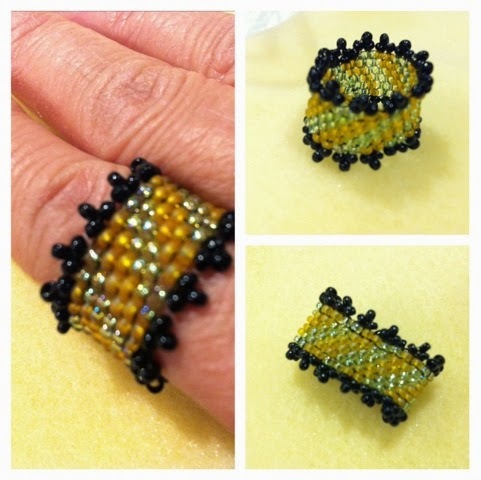 There's a Dazzle-It Ring Blog Hop hosted by Carmi to showcase all the fine creations. I had a blast making this ring. It's been awhile since I've done peyote stitch and I had to restart a couple of times but finally got the hang of it. This is my finished product of Green and Yellow "Sinuous" Ring that came with the package. I'm already thinking of doing a circular tube peyote ring. Will post it once I finish it. I think I found my new calling. But oh my aching eyes. 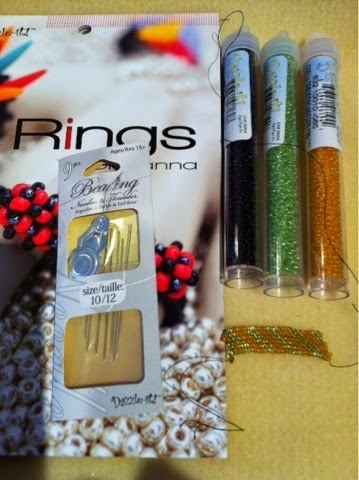 At 12:16am, made two additional rings with Dazzle-it beads. Very nice. The black trim (is that picot stitch? I'm a newbie) reminds me of fleur de lis. I love the contrast that creates. You sound like me. On right is not enough! Such a smart color combo!! the black really finishes it off and makes it look regal, wonderful work! Marissa, I was so pleased you could join in on this blog hop! I am particularly satisfied to see that you had a little time to even make a few more rings! Eileen...yes that's a picot stitch. thanks all for stopping by my blog. I really had fun doing the rings. Carmi...thanks for sending the goodies. Couldn't let them go to waste, so I had to create multiple rings. I'll make some more....maybe matching bracelets....once I find some time. The beads are raring to be made. LOL! OWOH 2011 - Final one! Welcome to my blog entry for the OWOH - One World One Heart Event where bloggers get to meet new friends, renew friendship and get inspired. I live in Ontario, Canada. I'm a mixed media artist and love to create with different media. I love making cards, creating beaded jewelry; journaling and taking photographs. I'm a night owl and do most of my work at night when my little guy is asleep. I also teach at a local rubberstamp and scrapbook store. My hubby is very patient with my abundance of art supplies, packed in the basement. My little guy is also very creative and I try to post his creation on my blog. I have a black cat - Minx who adopted us six years ago. To all my last years blogger friends and new friends, thanks for joining One World One Heart. Thanks for stopping by and hope you enjoy this magical experience. For art Aidan had to create a MOLA design. His art inspired me to make one on my Journal. "Mola or Molas, is a hand-made textile that forms part of the traditional women's clothing of the Kuna people. The full costume includes a patterned wrapped (saburet) a red and yellow. Themola, ormolas, is a hand-made textile that forms part of the traditional women's clothing of theKuna people." In Dulegaya, the Guna's native language, "mola" means "shirt" or "clothing". The mola originated with the tradition of Guna women painting their bodies with geometric designs, using available natural colors; in later years these same designs were woven in cotton, and later still, sewn using cloth bought from the European settlers of Panamá.. High-gloss epoxy resin clear coat that makes pieces POP while protecting them.Resin generally intimidates me, I used a resin product called Envirotex a couple of years ago for some pendants and the results were not that great, some pendants resulted in being sticky and tackiness. When I saw ArtResin at Deserres, I was sceptical and didn't buy it until a few more visits later. I bought a small packet of 2oz sampler. It worked well on my first attempt, although I have to apply a little more on a batch, as I applied it unevenly. One good thing about ArtResin is it is odourless -(compared to Envirotex's overpowering smell). I highly recommend ArtResin for its ease of use and odourless. I work fulltime in the IT industry but in my spare time (that means sleepless nights). I make hand-made cards (3D and pop-out), beaded jewelery, art pieces / coasters, bookbinding, teach at a rubberstamp / scrapbooking store and volunteer at my son's school.